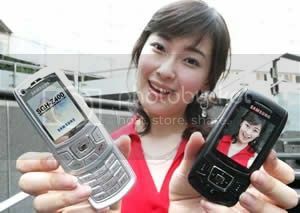 The Samsung SGH-Z400 featuring a 2 megapixel camera with 4x Digital Zoom is just 19.2mm thick and is slim enough to fit snugly in the palm of the hand or back pocket. The Samsung Z400’s semi-auto sliding action enables the user to effortlessly slide up or down with just one graceful touch. The Samsung SGH-Z400 provides enough internal memory including the expandable microSD memory card slot to save and store your documents, photos, music and video with sound. The sleek Samsung Z400 will be on offer in a silver colour and available to buy in Europe from June 2006, although price currently not known.